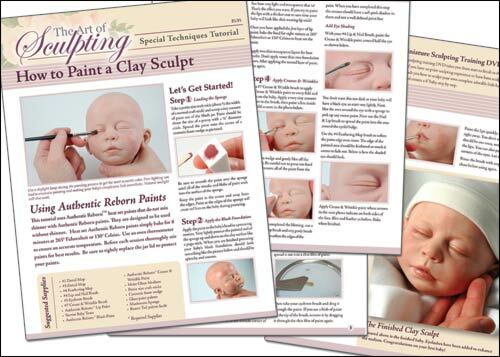 Heavy duty four-page training guide on painting clay sculpts. Have you heard the horror stories about paint on one-of-a-kind polymer clay babies changing color? That can happen when you use air dry paints. Have you seen pictures of one-of-a-kind babies that look like they were painted by a 5 year old? Too much red on the lips or splotchy skin color. What paints should you use, where and how should you apply them to get the very best results? Its not always easy to know how many layers of paint to apply. Why pay for training that you don't want or need? There are many reborning "How To" books on eBay, but the good ones will cost you $45 or more. And out of 15 chapters you only really need a few instructions but you have to buy the whole thing in order to get the few you really want. You can buy just one chapter at a time instead of the entire book with Authentic Reborn's Special Technique Tutorials! With the Special Technique Tutorials you can get exactly what you need. These tutorials are printed on heavy gloss card stock to last you a long time. The tutorials even have pre-punched ring binder holes so you can build your own "How To" book with the information you need. Each Special Technique Tutorial comes with many full color photos of every step with clear directions leading you all the way. When using these Special Technique Tutorials you can lay them flat on your work table and when you are finished return them to your "How To" ring binder for safe keeping. The Painting Clay Sculpts Tutorial takes you one step at a time through the entire process of painting a clay sculpt. You'll learn how and here to add blush, how many layers of lip paint to use, and how to enhance creases and wrinkles to make your sculpt look incredibly lifelike. The Painting Clay Sculpts Tutorial uses a 19" doll as the painted example, but the tutorial will apply to ANY sculpt at any size from 6 inches to 22 inches. This tutorial covers painting the head only, but the blushing technique can be applied to the entire doll..